Wolfgang Amadeus Mozart. Very Good. In very good packaging. Charles Mackerras-Mozart: Five Early Symphonies, Nos. 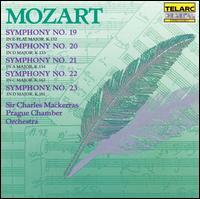 19-22 by Charles Mackerras. Fine. 089408021725 This item is guaranteed to play perfectly with all original artwork and materials. U. Very Good. CD, and case in very good condition. Appears almost like new!